DA Form 5109 or the "Request To Superior To Exercise Article 15, Ucmj, Jurisdiction" is a Department of the Army-issued form used by and within the United States Military. The form - often incorrectly referred to as the DD form 5109 - was last revised on September 1, 2002. 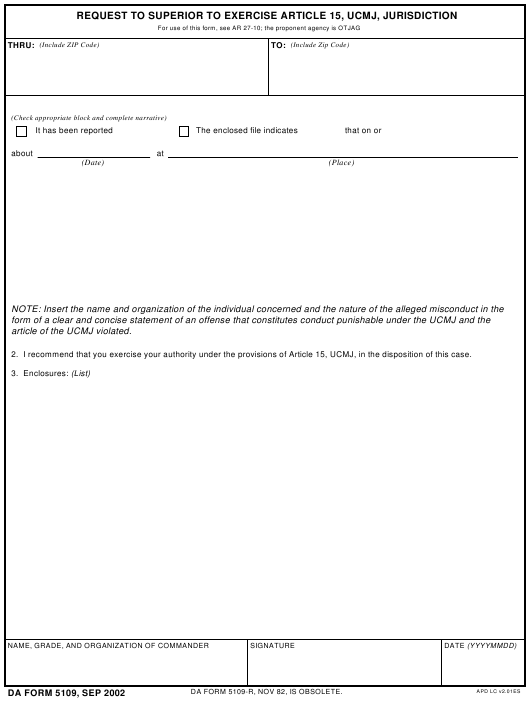 Download an up-to-date fillable DA Form 5109 down below in PDF-format or look it up on the Army Publishing Directorate website. article of the UCMJ violated. 2. I recommend that you exercise your authority under the provisions of Article 15, UCMJ, in the disposition of this case. DA FORM 5109-R, NOV 82, IS OBSOLETE.